Angela Quintal, right, and Muthoki Mumo. 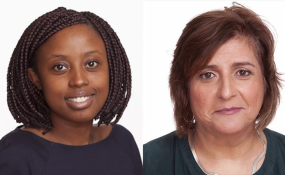 Dar es Salaam — The Committee to Protect Journalists (CPJ) has released a statement saying that two of its staff; Angela Quintal, Africa program coordinator, and Muthoki Mumo, Sub-Saharan Africa representative, "have safely left Tanzania." This comes after the two journalists were arrested and detained on Wednesday November 7 by Tanzania's immigration officials who interrogated them about their work. They were in the country on a reporting mission for CPJ. The arrest of the CPJ staff attracted worldwide condemnation from the media fraternity, civil society and politicians. However, the government of Tanzania, through its immigration arm, came out to defend the motive of the arrest. CPJ Executive Director Joel Simon expressed appreciation to journalists, media, press freedom organizations and government officials who spoke out about Quintal and Mumo's detention. "The two CPJ staff members have now safely left Tanzania," said Simon in a statement. Simon urged the Tanzanian authorities "to halt their ongoing crackdown against a free press." "Angela Quintal and Muthoki Mumo traveled to Tanzania to understand the challenges facing the Tanzanian press and to inform the global public," said the CPJ boss. "It is deeply ironic that through their unjustified and abusive detention of our colleagues, Tanzanian authorities have made their work that much easier," he said. "It is now abundantly clear to anyone who followed the latest developments that Tanzanian journalists work in a climate of fear of intimidation," he noted. "We call on the government of Tanzania to allow journalists to work freely and to allow those who defend their rights to access the country without interference," he further said. The country's Immigration Department said it had arrested them because they violated their stated purpose of visit to Tanzania. Immigration spokesperson Ally Mtanda told The Citizen that the department had arrested the two journalists and questioned them, saying, "... they arrived in the country on October 31, 2018 through the Julius Nyerere International Airport (JNIA) in Dar es Salaam and they said the purpose of their trip was normal visit." "However our officials established that they started holding meetings with local journalists and that's contrary to the conditions of their entry permits," noted Mr Mtanda. The immigration said the journalists were allowed back to their hotel after questioning, however, their travel documents were seized. According to Mr Mtanda, the immigration spokesperson, the journalists were later briefed on what procedures to comply with when they enter Tanzania and the permit conditions to adhere to. "... if they were intending to hold meetings with journalists, then they should have contacted the relevant authorities before they started doing those activities," he explained. "After arresting them and educating them, we released them on the same day. We continued holding their passports for some time but we have already returned the documents back to them," he stressed. The Acting Chairperson for Tanzania Editors Forum (TEF), Deodatus Balile said he was, and a colleague, supposed to meet [the freed journalists] on Sunday. "Their questions focused on wanting to know the level of freedom of media in the country," he explained. He said conversations underlined the disappearance of a journalist Azory Gwanda and the CPJ journalists asked what steps had been taken so far by the media in the search for Anzory, a journalist for Mwananchi Communications Limited who "disappeared" months ago. In a statement, CPJ said during detention, Quintal and Mumo's phones and computers were also seized. "While they were detained, a false tweet saying they had been released was sent from Quintal's personal Twitter account and repeated attempts were made to access Quintal's email."